Members of the Vizcaya Museum and Gardens Trust will integrate the public’s ideas into an evolving master plan for developing a new cultural center at the county-owned estate and grounds on South Miami Avenue in Coconut Grove. Three public forums will be held from 6 to 7:30 p.m. Sept. 24, 9 to 10:30 a.m. Sept. 26 and 6 to 7:30 p.m. Sept. 29 at Vizcaya Village Garage, 3250 S Miami Ave., for people to learn about the Vizcaya Village and share ideas for its future. The forums are an important element of a planning process being facilitated by Miami-based architects MC Harry and Associates and Washington, DC-based Quinn Evans Architects, said Joel M. Hoffman, executive director of Vizcaya Museum and Gardens. The Village is the historic property across the street from the main house and gardens that businessman James Deering began building in 1912 on 180 acres. A member of the Deering Harvester Co., he had an avid interest in landscaping and plant conservation, both of which Mr. Hoffman said played a role in the design of Vizcaya. Mr. Deering, who was advised by doctors that sunshine and warmth would help alleviate symptoms of anemia, planned to restore his health at Vizcaya but died in 1925 and left the villa and estate to his half-brother, Charles. In 1953, Mr. Hoffman said, the Deering family gave the property to the county with the deed specifying it be used to preserve the historic integrity of the house and garden and be used a museum. “They envisioned the site could have uses as a park,” he said. “When Vizcaya became a county parcel, it was operated by the Parks Department.” The department occupied a number of agricultural buildings, including the dairy barn and chicken coop. 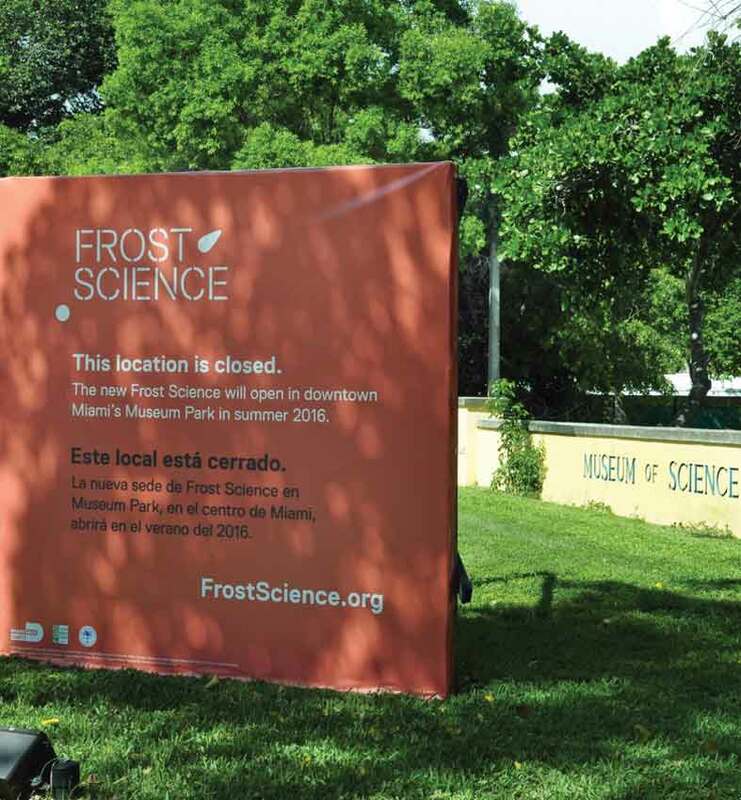 The Patricia and Phillip Frost Museum of Science built a facility on the property but, in the late 1990s when it wanted to expand and Vizcaya was designated as a historic landmark, Mr. Hoffman said there was concern the expansion might diminish the property. In 1998, the county’s Vizcaya Museum and Garden Trust was formed and took over the administrative function of the entire Vizcaya Village, the historic property across the street from Vizcaya’s main house and gardens, including the site occupied until this summer by the museum. The upkeep of historic infrastructure and building a museum to allow use of the community resource has been funded by $50 million from the voter-approved 2004 $2.9 billion General Obligation Bond program, allowing the county to fund neighborhood and regional capital projects over the next 15 years. Currently, about $20 million is left for capital projects the trust would like to create such as space for classrooms, hands-on activities, much-needed parking and possibly an auditorium or exhibit space. When the referendum was passed, Mr. Hoffman said, it included language about Vizcaya Village and that the site of the science museum would revert to Vizcaya for its use. Now, the trust is moving through the steps of tackling a master plan to enhance the historic integrity of the site for its increasing visitors, who have almost doubled in the past eight or nine years, Mr. Hoffman said. Mr. Hoffman and Vizcaya’s staff members see an opportunity for an urban agricultural program and focusing on the farm-to-table movement. Additionally, he said, they’d like to link Vizcaya into the Underline pathway under the Metromover. The trust in a competitive selection hired its master planning team. The next steps, Mr. Hoffman said, are helping the public understand Vizcaya’s history and needs, gathering input from the community on its desires for the Village, and using that information to refine the master plan. Ultimately, Mr. Hoffman said, the trust will bring recommendations it formulates to the county commission for approval. May I humbly suggest that they do not tear any building down but re-purpose them instead. As an example, make the Planetarium a theatre for any group or individual who wants to put on a show be it theatrical or a concert– with no upfront costs to the artists who traditionally don’t have any money anyway. If the Trust is really strapped for cash, they can ask for a small percentage of ticket sales.